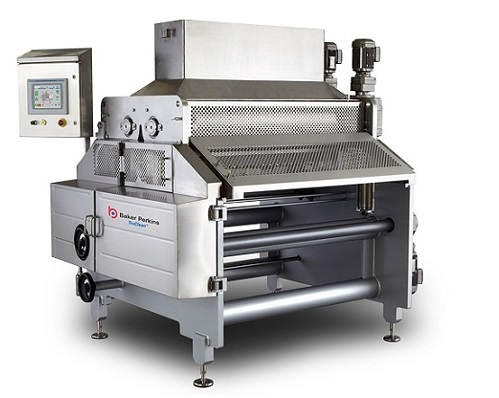 The Baker Perkins TruClean™ wirecut machine can now produce a variety of bars, in addition to soft dough cookies. This broadening of capability means that soft filled bars, and unfilled cereal and energy bars, can all be produced with high levels of flexibility and weight accuracy. Changeover between cookie and bar modes is simple and rapid, achieved by fitting a product specific die and filler block, plus a divider plate in the hopper for filled bars: fruit paste is the standard filling. The TruClean™ is the latest version of North America’s best selling wirecut, which is becoming increasingly popular worldwide as consumer tastes widen. Baker Perkins unique die and filler block technology, used successfully on the previous generation of wirecut, ensures weight accuracy by strict control of extrusion parameters. The wirecut is part of the new TruClean™ range, the result of a step change in Baker Perkins’ approach to hygienic design. Driven by industry demands for equipment that reduces cross-contamination risk and is easier to clean, every aspect of the machines has been redesigned for hygiene, but without sacrificing the high levels of productivity and reliability for which Baker Perkins is renowned. This radical approach has led to upgrades in everything from the choice of materials and detailing of components to overall appearance, access and visibility. As a result, operation and maintenance have been made easier and, along with improved hygiene, will appreciably reduce lifetime cost of ownership. All the Baker Perkins biscuit equipment range is being upgraded to the TruClean™ standard, which offers three levels of hygienic design, from which customers select the one most suitable for their own cleaning regime and cross-contamination risk.